But these fireplaces aren’t for the old fashioned. Built-in and faux are so not hot. 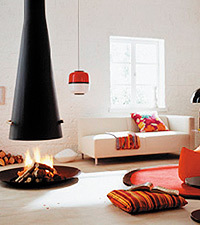 We are talking about Suspended Fireplaces. These modern and technologically advanced fireplaces have it all going for them. They add a beautiful sculpture-like structure to your home that are not only functional, but inviting as well. What a better way to focus your eye on a room than a unique fireplace that will be a great conversation starter. Summer is here, and the fireplace is indoors, but before getting cozy on the couch, enjoy a night out on the deck. Yes, the deck. But not the square, ever-so-typical deck, either. Today’s decks are all about form and function, and square they are not. 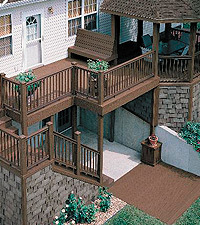 A deck should accent the home in both function and beauty. Some of the hottest trends in decks are multiple levels. Why should a deck only be on one level? Each level can have a separate function, yet tie together to create a stylish outdoor lifestyle. The same goes for railings. They may be there for safety, but they shouldn’t be the eyesore in an otherwise perfect setting. Mix different materials together like iron, cable, or even glass panels to those wooden beams.